I kept that in the back of my mind and finally in the summer of 2011 I picked up the complete series of Mapp & Lucia pretty cheaply from Amazon UK. 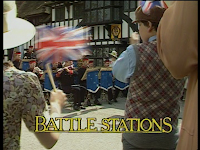 The reason I was so interested in this series was as I finished up Mulberry I absolutely adored Geraldine MacEwan, I have always been a fan of Prunella Scales and I know anything Nigel Hawthorne is in will be wonderful. I was excited to watch this series again. The locations are gorgeous and the stories are humorous and memorable. I have a rule for this stuff I randomly pick. If I pick a series that have standalone episodes I will just watch one or two episodes and then move on to pick the next series. If I pick a series where episodes have an overall theme or where episodes are connected, I will watch at least the whole series over a couple of weeks. Along time ago when I started to randomly pick shows to watch (and before I started writing a blog), I picked I Claudius. So I watched the first episode of the series and then I moved onto another series for the next week. 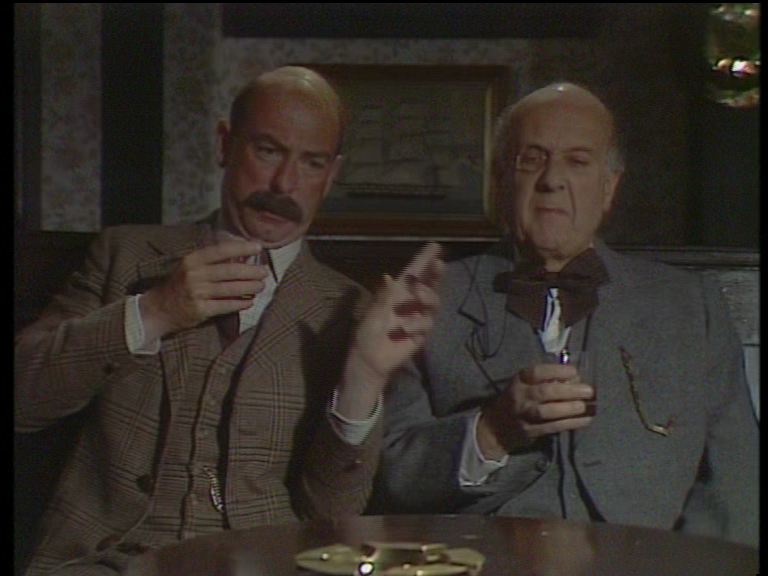 Then about 6 months later, I picked I Claudius again and then watched the second episode. I knew if I was ever going to get through the series, I would need to come up with a better plan otherwise it would take twenty years. So now if something has multiple episodes that continue one into another, then I will watch more of those episodes. That’s what I am doing here. I decided that I would view over the course of a couple weeks the complete first series of Mapp & Lucia as Series 1 is one continuing story. I will break this up into a couple of articles as I look at all five episodes of this first series. We pick up the series a few months after Emmeline Lucas’ (Lucia) husband passed away. It is 1930 and she lives in the village of Riseholme. She no longer does the things that she used to do as she has withdrawn from public life. Amongst the things she has given up is the yearly Elizabethan Fete which is now being handled by Daisy Quantock. Daisy stops by to try and get Lucia involved in the fete in some way. Of course the role that Lucia normally played will be handled by Daisy but Daisy has some menial role for Lucia. The thing is, Daisy doesn’t really want Lucia’s help but rather remind Lucia that she is now in charge doing something that Lucia once loved to do. These are the complexities of English upper-class in the 1930s. It is interesting as it is clear Lucia can barely stand the sight of Daisy let alone any time Daisy comes near her to hug her. Once again Lucia is not interested in taking part and Daisy leaves to continue to look after the Fete. We then meet Lucia closest friend Georgie. Georgie visits Lucia and learns that his good friend wants to rent a house for a couple of months in the town of Tilling. The good news is the house is owned by a woman who had a holiday in Riseholme they met a couple years before. 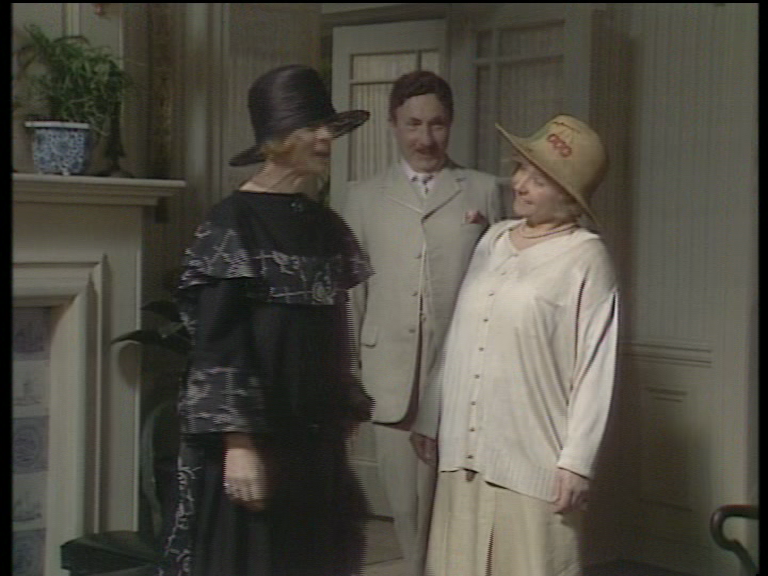 Her name is Elizabeth Mapp and Lucia and Georgie had cruelly let her believe the French saying for good bye was not au revoir but au reservoir! Mapp has used it ever since and we soon see that now all the people of Tilling use it too. Georgie and Lucia go down to Tilling in their chauffer driven car and they check out Mapp’s home called Mallards. It is a beautiful place with a wonderful garden and Lucia falls in love with it instantly. While they are there, they check out the rest of Tilling and meet some of the other residents of the village including Major Benjy Flint who drinks a lot, Rev. Kenneth Bartlett who speaks with a Scottish accent although he is not Scottish, Mr. & Mrs Wyse (Mrs. Wyse wears a fur coat in the summer) and Quaint Irene who is a butch painter. 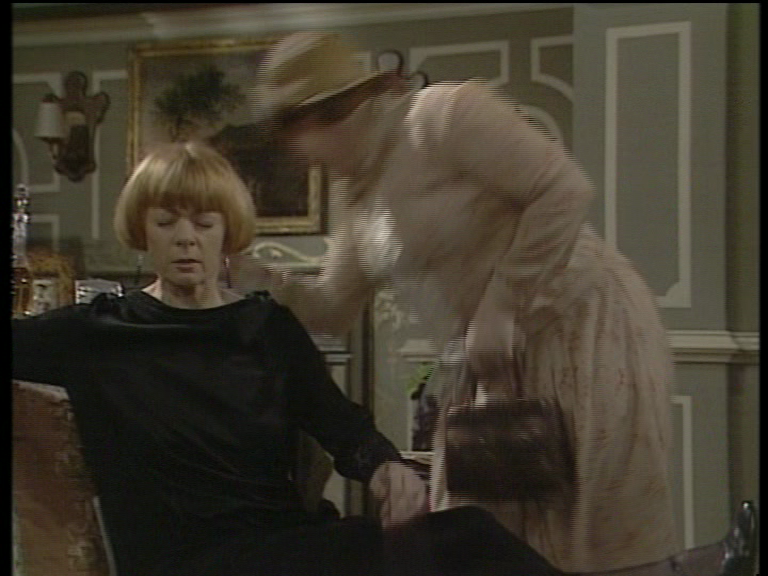 Even Georgie falls in love with Tilling and decides to rent a house that is owned by Mrs. Wyse. Now there is some kind of weird deal going on as Mapp will be making some money off of Lucia living in her house. That means that Mapp will live in the house of Ms. Godiva Plaistow and Ms Plaistow will live in the house of Quaint Irene. Lucia and Georgie return back to Riseholme where Daisy is waiting for Lucia. Daisy needs Lucia to be the Producer of the fete because Daisy cannot handle it. Lucia cannot refuse such an offer. 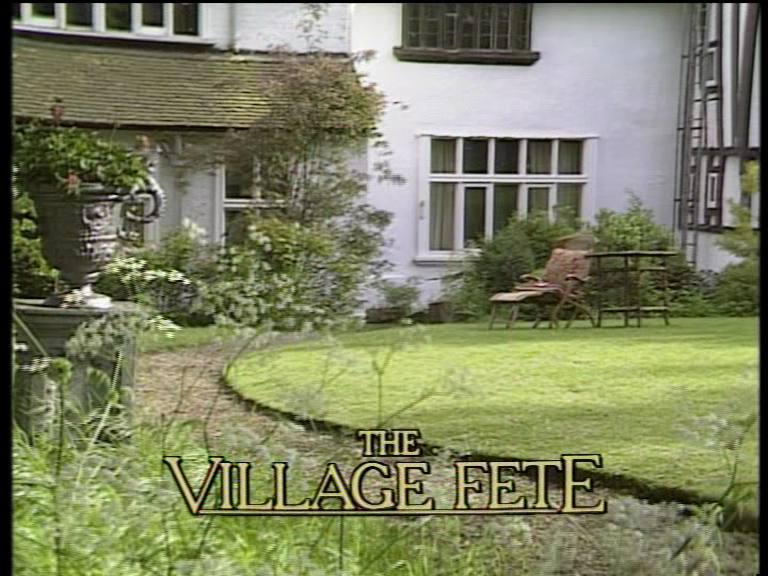 The next day Lucia gathers all the village residents who are taking part in the fete and they all have a rehearsal. It’s not very stellar but a lot of work needs to happen. 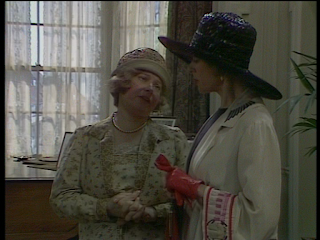 In these fetes Lucia normally would play the part of Queen Elizabeth in the production but as Daisy had taken over, Daisy gave the plumb role to herself. Now that Daisy sees she has made a huge mess of the production, she reluctantly asks Lucia to take that role as well. Of course Lucia accepts but she has little time as she is preparing to head off to Tilling soon. This is a great opening episode to the series. 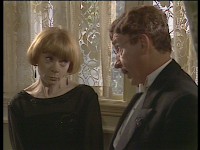 The funny thing is that the series is called Mapp & Lucia but there is actually little of Mapp in this episode. That’s OK though because she is mentioned at the beginning of the episode and there is quite a bit of hype that surrounds her so by the time we get to meet Mapp, she isn’t a complete stranger to us. Mapp is the Tilling version of Lucia. Certainly not bad off money-wise and is kind of the social leader of the community of Tilling. Everyone in Tilling took Mapp’s lead to use Au Reservoir as a way to say good bye. 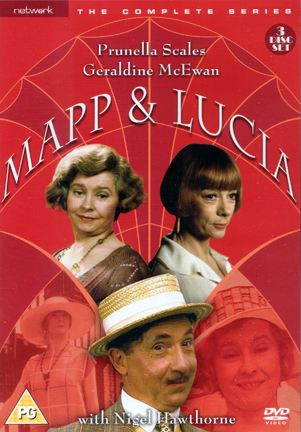 The difference between Mapp and Lucia is that Lucia is refined and well raised being shown how to handle all kind of situations and Mapp is a rougher around the edges and really lacks tact. Au reservoir is a great example. This is also our first look at Georgie. Georgie is a Dandy. He is well dressed and has impeccable manners. He is in his own world but adores Lucia. But more as a friend than anything as it is clear that Georgie has no romantic interest in Lucia or probably any girl for that manner. There is a scene when Lucia and Georgie are heading back from Tilling and Lucia starts talking about how close the two of them are and how her husband is now gone. Georgie starts to become very uncomfortable as he thinks Lucia wants to marry him. He starts to fidget a lot won’t even look her in the eye. Finally she talks about how they are just really good friends and Georgie is immediately relieved. Granted, the two of them are very competitive with each other. They both play piano and actually play duets together. In the episode they play a song as a duet together that neither admit to practicing yet prior to going over to Lucia house, we hear Georgie practicing that piece. They play the duets with such vigor that it is almost their own version of making love with each other. The piece we see them play in the episode builds and builds to a climax and they stop playing breathing heavily and being very exhausted yet satisfied. Regardless of the platonic nature of their friendship, it doesn’t stop others from thinking something might be going on between the two of them. For example, in Tilling Major Benjy assumes that Lucia and Georgie have something going on. Benjy wonders to Mr. Wyse when Lucia and Georgie are “doing it” wonders if Georgie keeps his rug on or not. The truth is that Georgie does in fact wear a rug! 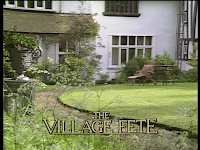 We pick up this episode with Lucia running the fete back at Riseholme. She plays the queen and even though things start to go wrong during the play, such as the boat background stage falling apart, she recovers nicely. With that out of the way, her and Georgie leave Riseholme and head out to Tilling where they each will have a house that they are renting down there. When Lucia arrives at Mallards, the name of the home she is staying at, Mapp is waiting for her in the parlour. This begins an uncomfortable series of run-ins and conversations between the two women as they both try to show who is dominant. Lucia continues to get more and more frustrated by Mapp because Mapp keeps letting herself in the house unannounced. It even leads Lucia to make sure the chain is always on the door to lock her out. There is also a misunderstanding about who gets to use the gardener Coplen. Lucia believes since she is paying his wages that she should be allowed to use him in whatever manner she wants while Mapp thinks that the gardener should be taking care of the different produce in the garden that she sells to the grocer. More and more things add up for Lucia as she is finding even knowing Mapp is tiresome. Georgie keeps asking Lucia if this it is time for war against Mapp. Obviously Lucia has been through this sort of thing before and probably revels in it. 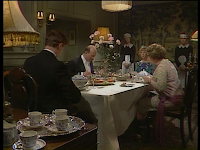 As things start progressing against Mapp, Lucia starts inviting other people over to the house for dinner starting with Major Benjy and Diva. The next night she invites Mr. and Mrs. Wyse and then after that Quaint Irene. It is at the first dinner that Diva realizes that Mapp is making a lot more money on renting out her house than she has been telling people. Lucia is not inviting these people over because she wants to get to know them. She wants to win them over to her side and to alienate them from Mapp. This is why she is feeding them lobster and giving them plenty of drinks when they are over. She even loses at bridge so people feel happy and enjoy themselves. The one person not invited to these dinners is, of course, Mapp. What I like about this series is that these are wonderful caricatures of wealthy people from the 1930s. No one seems to work! I think there is a lot more background in the novels which I might read to get some more information. Watching these made me wonder how Georgie got his money. It is funny because Lucia and Georgie seem to be in a world by themselves. They are their own little clique and none one is invited in to join. They appear to be doing nice things for other people but ultimately, it is for their own gain. It is usually for social gain or appearance. They are very flippant. I didn’t notice it the first time I watched this but there are some nice touches giving some clues for the upcoming episodes. I will talk about them a little more next week. Watching the episode this week, I noticed how pleasant the theme music is for this series. The music is by Jim Parker. It is pleasant and fits beautifully to the visuals of the series. It fits perfectly and captures the right tone. 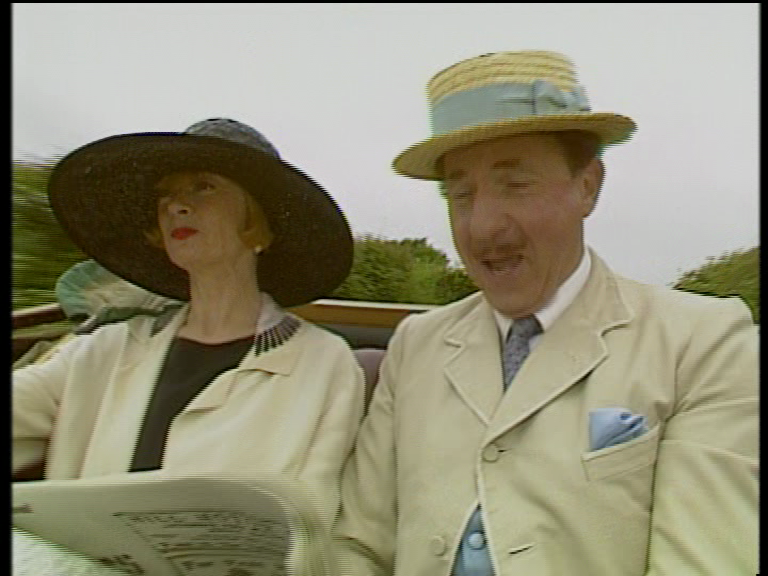 The incidental music for Mapp & Lucia reminds me a little of the music for All Creatures Great & Small in a way because whenever they are travelling or going from one location to another, this music plays and really creates a world from the 1930s that I believe in as it is very carefree. It just makes me smile when I watch it and after watching these two episodes, I found myself humming the music. It is a sweeping piece of music that has a very classical feel using a range of strings and woodwinds. It is very light and I think that is why I think it fits so perfectly because the music matches the location shots of Tilling so well. I need to get my hands on this piece of music. 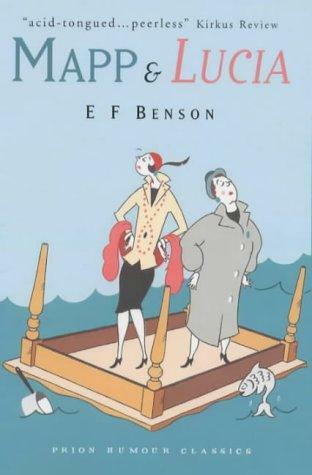 I have never read any of Benson’s work before but I think I might want to give it a try. 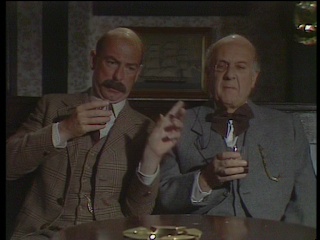 The thought that someone can write ghost stories and then write something like Mapp & Lucia is pretty cool. I think it is interesting that some consider to series to be a drama. It’s a hard one to pin. I personally think it leans closer to comedy but it is not a situation comedy. 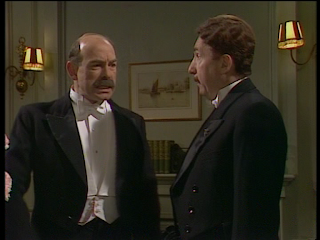 It is more of a lighter series that fall in the same genre as All Creatures Great & Small or Jeeves & Wooster. Next week: Probably will be a longer article as I will take a look at the last 3 episodes of series 1 of Mapp & Lucia: The Italian Connection, Lobster Pots, and The Owl and the Pussycat. I also will cover a little more on the cast and Gerald Savory who dramatized the episodes from the novels. I also want to talk about how this Network DVD release of these episodes seems a little different from their normal standard of releases. 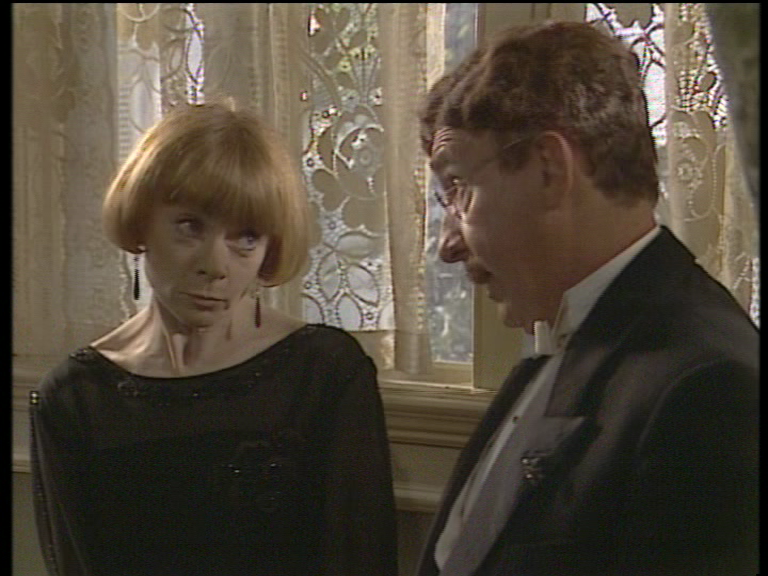 Mapp and Lucia is one of those series that has been in the back of my head for years without my actually doing anything about it. I haven't been a big fan of Prunella Scales, but I really like Geraldine McEwan and Nigel Hawthorne, so I am sure this would be good to watch. Besides the actors, the setting and themes seem right in the sweet spot for my interests, so someday I am sure I will get around to this. I also have to thank you for inspiring my British tv-watching methodology. When I heard about your random pick from an envelope provess, I decided I would adapt that to my purposes. however, we differ in a few important aspects. I put together a list of all my shows and select a random one from the list, then watch the entire run. It then goes to the other list of completed shows. When I run out of unwatched shows, I start the random picks again. All in all, 9t took me aover a year and a half to get through the list the first time, and this doesn't even count Doctor Who or movies - those are special cases! In the time since I completed the first run-through of the sets, I have been watching the various things I have on the computer and not on dvd. I should hopefully be done with that soon so I can begin the dvd run once more. Anyway, far too much rambling - I look forward to the next installment of your entertaining blogginess. The R2 set is ridiculously cheap compared to the Acorn R1 set which I will touch on next week. The downside is that the quality of the episodes may not be as good as it should be which I will present my theory next week too. Either way, with the set being cheap enough (in my opinion), the quality of the series makes up for the quality of the episodes. I am glad some of my viewing methodology has rubbed off. As you know, I used to do full series too but I have too many series to do that with. I will need to send you my current video list. Once I complete the latest updates, it will be over 700 pages long. 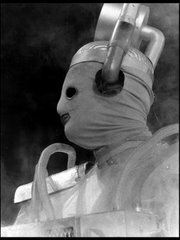 Not bad for a boy who only really cared about Doctor Who in 1984!